1. The pathophysiology of inflammatory disease and its regulation. 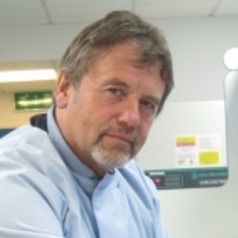 I am currently a named individual in eight clinical studies with consultant clinicians and scientists, that are being organised jointly with Cardiff and Swansea Universities and also with Cwm Taf NHS Trust. These studies involve new biomarkers in stroke, polycystic ovary syndrome, cardiovascular disease, sepsis and type 2 diabetes all diseases in which inflammation is a major component. My role in these studies is dual as I can act as both statistician and as a Biomedical Scientist analysing biomarkers of inflammation. I am regularly asked to act as a statistical advisor to physicians and scientists for sample size determination, methodology and sampling including acting as advisor to PhD and MD studentships. I have acted as an external advisor on two PhD students who have undertaken British Heart Foundation funded research on nitrate infusion in regulating cardiac vessel vascular tone in Cardiff University. I have investigated the molecular basis for the ability of exercise to regulate lipid metabolism and inflammation through the activation of nuclear transcription factors. This work as the potential to allow clinicians to “dose” exercise and to determine more precisely the amount and type of exercise that can generate specified molecular and lipid metabolic effects. I have increasingly undertaken studies in applying bimolecular methods in the specialised area of Nutraceuticals that determines the precise pharmacological actions and basis for nutrient associated health benefits. These components include dietary lipids present in dairy products and flavonoids/polyphenols present in numerous dietary components. Through my collaborations with Cardiff University, in particular the Welsh Heart Institute, I have supported MD studentships. I am supervising a PhD studentship in collaboration with Sultan Qaboos University Oman, investigating camel milk-derived lipids’ ability to regulate inflammation through interaction with transcription factors such as the PPARs and Nuclear Factor kappa B.